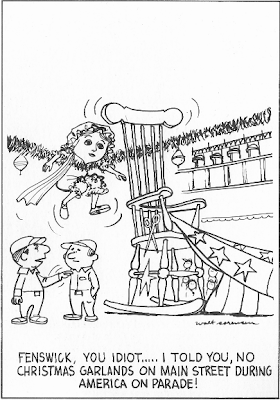 Only a few days late after a nice long rest here at Passport to Dreams World HQ and we've got a story to share with you about the fourth of July! .... About the fireworks, to be precise. Now, fireworks have always been a part of Disney theme parks, for better or for worse. Of course way back at the beginning they had very little resemblance to the cloying three-hankie schoolroom malarkey that passes for nighttime entertainment today. These displays were about fireworks, not soundtracks, and Disney did them better than anyone else. 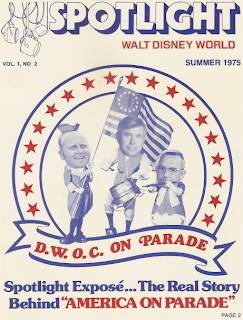 In 1975 and 1976, Disney was hitting the "Patriotism" angle especially strongly. It's true that today few things seem as inherently "American" as Walt Disney World but the early 70s featured such promotions as "I Am An American Week" celebrating the birthdays of Washington and Lincoln back before they were complied into a single holiday (don't blame Disney for the ludicrous name; Florida governor Ruben Askew made it an official Florida event in 1973). 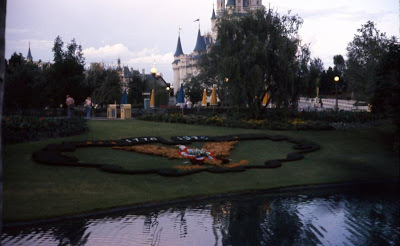 But 1975 - 1976 were especially star spangled at Walt Disney World; the Bicentennial promotion was underway. The freaky / awesome America on Parade rolled through the park twice daily. You could see the Hall of Presidents for free - a 90 cent value (that's almost four dollars today, by the way)! There was even a special floral display on the Hub. And yes, in case you've been wondering for your entire life why the Electrical Water Pageant ends with "Grand Old Flag", it's because of the Bicentennial. "In August 1973, the Entertainment Division began preparing for the 1975 season of shows. In keeping with the Bicentennial celebrations which will begin this summer, the fireworks will feature red, white and blue exclusively." "Realizing that the tremendous demand for red, white and blue fireworks during 1975-76 will far outreach the supply in the United States, Disney experts set out to find other sources from around the world. A partnership of fireworks manufacturers from eight countries was established, under Disney direction, to help meet the coming need. Included are pyrotechnics experts from Japan, Free China, France, Brazil, Great Britain, the United States, Canada and Mainland China." "In the past, the visual effects of fireworks have generally been a potpurri of color. But as Disney's imaginative teams envisioned the pariotic shows, they had some very specific designs and effects in mind . Armed with artist's rendering which illustrated these various designs, they traveled around the world searching out experts in such countries as Japan and Mainland China. These drawings introduced a new approach to an ancient art and soon became a kind of universal language where no other could be understood." Or, to put it another way, Disney spared no expense to make these fireworks as elaborate as possible. But that, of course, is the public side of the story, written by Walt Disney World's publicity department. Enter... Spotlight Magazine. "What are we looking for? Humorous stories, short jokes, cartoons, serious short stories, humorous photographs, quality photographs (black and white only) you wish published, poems, jokes, limericks, jokes, satirical views of company related items, jokes and more jokes! In fact, we can use almost anything you can think up." Whereas Eyes and Ears is the safe and publicly acceptable version of events, Spotlight Magazine throbs with the wild and bitter imagination that any front line cast member, past or present, will recognize as their own. Several include articles by Randy Bright. But there's something else to it, too. What began life as inside comedy has become, over time, obscure comedy. Spotlight Magazine has become the ultimate inside joke, a blend of comedy and history of the Vacation Kingdom that is something like Disney Nerd Nirvana. 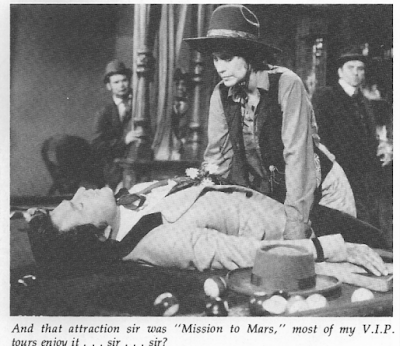 And so, now that the requisite background information is out of the way, I present for your delight, an article from the Winter 1976 issue of Spotlight Magazine written by Rich Whitt. 9:55 pm - Following the conclusion of "America on Parade", hard hats which have already been distributed to guests should be put on and protective eyeglasses and clothing adjusted. 9:59 pm - All employees should be under cover and all air traffic cleared from the area. 10:00 pm - Fireworks begin from four different locations around the Magic Kingdom. 10:02 pm - Overture begins, played by the New York Symphony Orchestra and sung by the Mormon Tabernacle Choir, live from a barge anchored in the Seven Seas Lagoon. 10:05 pm - Fifty hot air balloons representing our fifty states arise from locations around Theme Park and start to twinkle red, white and blue. 10:09 pm - Two giant American flags burst into flame from sites atop the Contemporary Resort and Space Mountain. 10:11 pm - 25,000 singers and dancers parade down Main Street singing "Yankee Doodle Dandy" while the Mormon Choir takes up singing it. 10:12.30 pm - On musical cue, the 59th Air Force Squadron will begin aerial bombardment of Sea World. 10:13 pm - Battleship "USS New Jersey" anchored off Treasure Island will open fire on the Chinese Junk and the Ports-O-Call. 10:15 pm - False ending. a. Fireworks sites launch ground-to-air missiles. b. Torpedoes and launched from Friendship I at "USS New Jersey"
c. Wave machine begins to operate. a. Sea World launches counter-attacked aided by forces from the Miami Beach and Daytona resort areas. b. The 59th Air Force falls in flames. c. The "USS New Jersey" explodes. 10:30 pm - All systems shut down, The End. Special Thanks to Matt Feige for the Spotlight Magazine blurb from Eyes and Ears. Oooh, "Malarkey!" Extra points for using the word of the day! Holy crap that was the greatest article yet! Thanks for sharing that. Curious about the reference to Friendship I. I'm guessing it can't be the Epcot water taxi since the article predates Epcot by 5 years. What does it refer to? You have got a nice blog site. Congratulations!